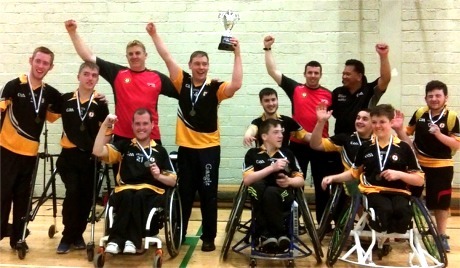 ULSTER retained the M. Donnelly Interprovincial Wheelchair Hurling League title in convincing fashion after a successful day in Boyle, Co Roscommon, where they won all three of their games. In the first game of the day Ulster played the host province Connacht, displaying great hurling skills to win with a final score of 3-0. Peter Lewis (2) and Conor McGrotty (1) scored the goals. The second game against Leinster produced a real thriller. Ulster started very strongly acquiring a 3-1 lead. Leinster came back to level the game with only a minute left on the clock. However Ulster succeeded in holding onto their title by scoring the winning goal in the dying seconds of the game. The goal scorers were Peter Lewis (3) and Conn Nagle (1). With the All-Ireland title now secured, Ulster could relax and enjoy the last game against Munster. They finished victorious once more, winning the final match of the day 4-2 with goals from Conn Nagle (3) and Peter Lewis. Ulster captain David Doherty accepted the trophy amidst great scenes of celebration from the travelling support. This was another fantastic day for Ulster Hurling as this young team showed great determination and spirit in winning the All-Ireland for the second year in a row.